Spring Arbor is a 55+ community in Middletown, Delaware with a small-town atmosphere that offers both new and resale attached and single-family homes. Spring Arbor is a smaller active adult community in Northern Delaware with easy access to shopping, restaurants, hospitals, and major roads. This 317-home community is close to beaches, wildlife areas, lakes, and golf courses. Conveniently located 22 miles from the Delaware Memorial Bridge and close to the cultural areas of Wilmington and the Brandywine Valley, Spring Arbor is situated in a convenient location. The luxurious 7,000 square-foot clubhouse of this charming community offers amenities usually seen in communities of much larger size. An added benefit of buying a home in Spring Arbor at Middletown is the low taxes - no state sales tax, no state tax on social security, extremely low property taxes, and reduced taxes on pension and retirement earnings. The Spring Arbor clubhouse offers an abundance of indoor and outdoor attractions. Residents can work out at the fitness center, relax with a favorite book at the library, enjoy a game of billiards with some friends, and get creative in the hobby rooms. There is also a great room, which serves as a social gathering place with a dance floor. Outdoors, residents can find activity partners on three bocce ball courts and a horseshoes area, or practice on the putting green. With a heated outdoor pool, large patio area, and a picnic area there are plenty of outside options for relaxing and socializing. There is even a tot lot, which is sure to appeal to grandchildren. 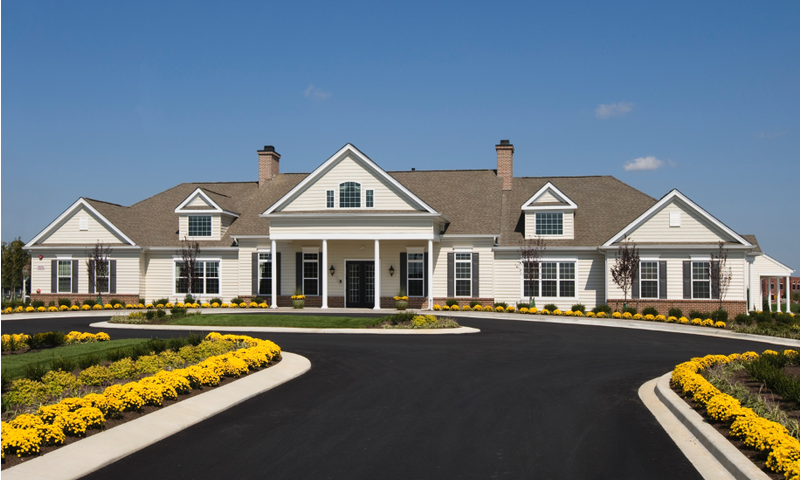 McKee Builders started construction at Spring Arbor in Middletown in 2007 and upon the community's completion there will be 135 attached homes and 182 ranch single-family homes. The Americana Series offers new and resale attached homes with 1,199 to 1,593 square feet with two bedrooms, two bathrooms, and an attached one or two-car garage. These low-maintenance home options offer plenty of living space with first-floor master suites. The Classic Series offers nine single-family home models with a variety of new and resale home options. These ranch homes are between 1,544 and 2,267 square feet in size. Most homes have two to four bedrooms, two to three bathrooms, and an attached two-car garage. This collection of homes features large eat-in kitchens, family rooms, and formal dining rooms. Spring Arbor in Middletown is an ideal setting for active retirees who want to live in a tight-knit community in a central location with a moderate four-season climate. Residents also enjoy the historic attractions in the area, as well as the large variety of shopping opportunities without having to pay sales tax. This 55 and better community offers many social opportunities. In addition to enjoying the clubhouse amenities, residents of Spring Arbor regularly meet for Saturday coffee, game night, and potlucks. There are a variety of interest groups open for joining, such as bocce, travel, billiards, and Rummy. Spring Arbor is located in Middletown, Delaware. In addition to shopping and dining opportunities, Middletown offers community events such as Christmas in Odessa, the Big Ball Marathon, the Hummer Parade, and the annual Peach Festival. The Middletown area also has a variety of community parks, walking trails, and world-class golf courses with 55+ discounts. Spring Arbor is conveniently located to I-95, and a short drive will take residents to the cultural areas of Wilmington and the Brandywine Valley, as well as the historic town of Odessa. Wilmington, Delaware is just a half hour drive away from Spring Arbor. There are plenty of activities available in Spring Arbor. Here is a sample of some of the clubs, activities and classes offered here. McKee Builders' plans call for 135 attached homes. The Americana Series offers homes that range from 1,119 to 1,593 square feet in size with two bedrooms, two bathrooms, and an attached garage. The Charleston and Savannah models are no longer offered as new construction and can be found in resale inventory. There will be 182 ranch single-family homes within Spring Arbor. The Classic Series features single-family homes that are between 1,544 and 2,267 square feet in size. Most homes have two to four bedrooms, two to three bathrooms, and an attached two-car garage. Alcott, Byron, Conrad, and Dickson models are offered as a resale only basis. Atwood, Brooks, Dalton, Kipling, and Wyatt are available as new construction. Great community with many activities . Nice area with lots of shopping near by. Close to the shore and New Jersey .very nice people. Don't move here ! Residents will spy on you and report every little violation. Well maybe if you like living with snobby people this will be the place for you ! Spring Arbor is perfect for me since I still work part-time so the location is ideal. It's also a good value with prices I can afford and really low taxes. I love the fitness center and swimming pool and my grandkids enjoy it when I take them over to the playground. 55places.com is not affiliated with the developer(s) or homeowners association of Spring Arbor. The information you submit is distributed to a 55places.com Partner Agent, who is a licensed real estate agent. The information regarding Spring Arbor has not been verified or approved by the developer or homeowners association. Please verify all information prior to purchasing. 55places.com is not responsible for any errors regarding the information displayed on this website.